Do you find yourself bored scrolling through Instagram now that everyone is doing the same thing? Is your feed full of posed yet effortless street looks, picture perfect flatlays and impeccable travel photos that are all starting to look the same? 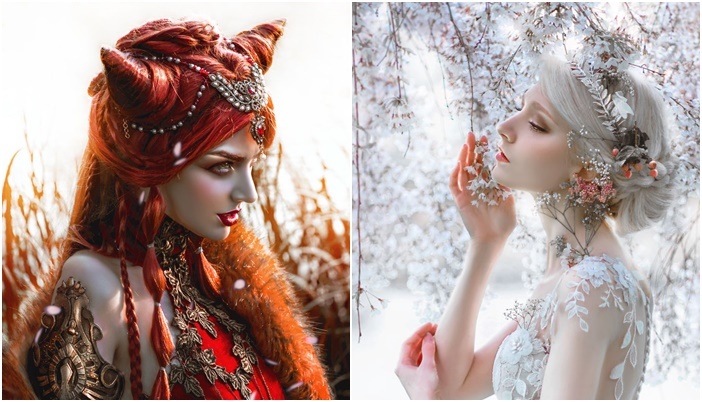 Well how about diving into the world of magical fantasy portraits photographed and edited by LillianLiu? She’s a young creative photographer who’s truly passionate about her art. She loves mixing photography with digital painting and the result is always mesmerizing. Her photo-shoots are almost trans formative, because she makes already beautiful modes look like otherworldly fairy tale princesses and fantasy characters. With every picture you realize that this girl has some incredibly creative ideas and what seems like a never ending well of inspiration. Take a look! 1.What a foxy lady. Quite literally! Loving the hair in this one. 2. Doesn’t she look like she belongs in a fantasy game? 3. Very royal in a sort of magical way, don’t you think? 4. Snow princess. This is what we all wish we looked like in the winter, isn’t it? 5. Magical midnight princess glowing in the dark. 6. This warrior princess is giving us Joan of Arc vibes. 7.Just casually leaning onto a piano, after a long day of being a gorgeous princess. 8. She looks like she’s the queen of deer and other woodland creatures. 9. An elf queen perhaps? She looks so graceful and elegant. 10. Is that a dress or is that very elegant armor? Either way it looks incredible. 11. Another elf-looking lady. Wonder what’s on her mind. 12. Not only does this photograph look royal, it almost looks like it belongs in a church. Simply divine. 13. What is that top and where can I get it? Seriously though the costumes in Lillian’s photo-shoots are out of this world. 14. This looks like a very precious painting, doesn’t it? All the colors, the poses, the drama. 15. How freaking cool is this one?